Children who suffer from ADHD have many challenges in school – both socially and academically. Until now, there has still been much we do not know about specific subject areas and how learning is influenced by ADHD. A new research study, however, sheds some light on how ADHD is connected to reading and maths abilities during the school years. Researchers looked at identical and fraternal twins. They were able to determine that genetic and environmental factors underpin ADHD behaviours, along with skills in maths and reading. The study helps us to better understand the connections between ADHD and these subjects, which are key ones for children to learn during their school years. The study chose twins to help differentiate between factors that were genetic – the nature part – and those that were environmental, which refers to the nurture term. Twins are often used in many different studies for this reason, which is thought to help by giving a clearer, more reliable and less biased result. Identical twins are matched for DNA in comparison with fraternal twins who typically share approximately half their DNA. Where identical twins are more similar on a specific trait like reading ability – and then fraternal twins are less similar on that trait, it is usually safe to assume the trait is an inherited one. But if a pair of identical twins is similar on one trait to the same level that fraternal twins are – like shyness, then the trait is likely attributed to the environment to some extent. This study began by testing reading and maths achievements in participants at the age of ten. Mothers of each pair of twins also completed questionnaires to explain any problems their children suffered with regards to hyperactivity and attention. 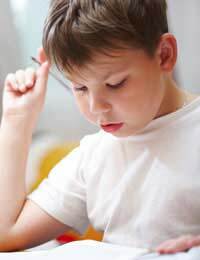 Results showed that ADHD behaviours along with reading and maths levels were affected by the same genetic factors. Even though it does not confirm the causes, it is thought that they may all be connected from a part of the working memory system in the brain. Even more interesting was that all three were also linked through shared environmental factors. Again, scientists do not know precisely what the environmental factors are but think possible ones include the classroom and home learning environments. If researchers can eventually pinpoint just what the environmental factors are, they might be able to manipulate them to help give more support to children who suffer from ADHD. The ultimate goal of these studies goes beyond just understanding ADHD. Children with ADHD often find that the symptoms and resulting behaviours make success at school much more challenging than children without the condition. Hopefully, future studies will be able to identify the specific genetic and environmental influences involved in ADHD. In turn, we can help to give ADHD children the best chance of success in reading and maths, both of which are key foundational subjects during the school years.